Whitney Houston (born on August 9, 1963 in Newark, New Jersey) is a Grammy and Emmy Award winning American R&B/pop singer, actress, former fashion model, record and movie producer. She is known for her soulful coloratura soprano voice, vocal power, range and melismatic skill. Houston is one of pop music's highest selling artists. She was labeled the "Queen of Songs" by Arsenio Hall, who described her as "the first lady of song". She is also known to millions as "The Voice", a nickname given to her by Oprah Winfrey. 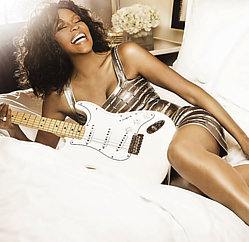 Whitney's debut album was released in 1985 to critical and commercial international success, and she went on to release seven consecutive number-one hits on the U.S. Billboard Hot 100 chart. She was one of a handful of African-American artists who received heavy-rotation on MTV during the network's early years in the 1980s. Houston continued her success into the 1990s with the release of several films and their corresponding soundtrack albums, the most popular of which was The Bodyguard (1992), which produced the worldwide number-one hit single I Will Always Love You. Houston's albums in the 2000s have been less successful. Her personal life became the subject of controversy because of allegations of drug abuse, especially after repeated cancellations of public appearances and erratic behaviour. Houston has since undergone an intense rehabilitation process and is currently recording an album that will be released early this year. In mid 2009, Houston released her seventh studio album, "I Look To You." The album debut at #1 on the Billboard 200. It became another Platinum seller. It was state in the UK Newspaper "The Mirror" that Houston is thinking about recording her eighth studio album. Subscribe to Whitney Houston RSS Feed to get latest lyrics and news updates. What do you think about Whitney Houston? Let us know in the comments below!